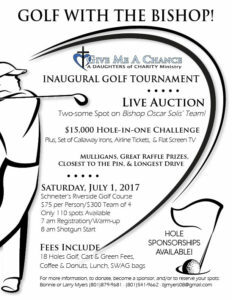 We’re excited to announce our Inaugural Golf Tournament with Bishop Oscar Solis! Please join us on Saturday, July 1, 2017 for fun and rewarding time. There will be a live and silent auction, raffle, Mulligan’s and Challenges. We will live auction a two-some spot on the Bishop’s team – what better way to get to know our new bishop? When you call or email us to sign up for the tournament, we’d love to share with you more information about becoming a hole sponsor! Please click on the image to print the flyer, and feel welcome to share it with your friends and family. For more information, to reserve your spots, donate, and/or become a hole sponsor, please call Bonnie for Larry Myers at 801-879-9681, 801-541-9662, or bjmyers08@gmail.com.